An Oyster Recovery Partnership boat scatters oyster shells covered in oyster larvae into the tributaries of the Chesapeake. Photo by the Paynter Lab/University of Maryland. New England fishermen sailed south to Maryland to poach oysters from the bay, sparking the so-called “oyster wars” of the late 19th century. Oystermen killed each other over prime harvesting grounds, and a State Oyster Police was formed to keep the peace. In the dead of night, “oyster pirates” snuck into the beds with dredges to scoop up the animals by the pound. But a century of over-harvesting, disease and pollution took its toll on oyster habitat in the bay, and the population plunged to less than 1 percent of historic numbers. This spelled trouble for oyster lovers, but also for the Chesapeake Bay ecosystem. Oyster reefs provide valuable habitat for fish, crabs and mollusks, which the fishermen rely on, said Walt Boynton, professor at the Chesapeake Biological Laboratory. Oysters also act as filters, providing a valuable clean up service. Nitrous phosphate runoff from wastewater, agriculture and storm runoff has broadened the bay’s “dead zone” dramatically, Boynton said, killing marine life. In a process called denitrification, the mollusks gulp down nitrogen, algae and sediment and spew out cleaner, clearer water. An acre of oysters can filter 140 million gallons of water an hour and remove 3,000 pounds of nitrogen a year, said Kennedy Paynter, director of the marine environmental science program at the University of Maryland. “That’s the highest denitrification rate reported in scientific literature that we’re aware of,” he added. In 1993, the Oyster Recovery Partnership — a coalition of scientists, environmentalists, government groups and hundreds of volunteers — mobilized to bring the oysters back to the Chesapeake. Their goal is to restore 20 historic oyster beds by 2025. But it’s been Sisyphean task — an uphill fight against limited resources and commercial fishing demands, according to Bill Goldsborough, director of the Chesapeake Bay Foundation’s oyster restoration program. This Chesapeake Bay Program video describes the Harris Creek restoration project. In 2010, Maryland passed the Oyster Restoration and Aquaculture Development Plan, which cordoned off 24 percent of the Chesapeake Bay’s viable oyster habitat for restoration. There, scientists raise oyster larvae by the billions in hatcheries. About 100 million larvae, each no bigger than a grain of sand, can fit in a paper towel in your hand, Goldsborough said. Then the tanks are drained, and a crane dumps the shells by the ton into boats where they are lugged to the restored reef areas. Gates on the boat’s stern open, and a conveyor belt sprays tons of the spat-covered shells over the waves, where they will settle and grow in clumps. 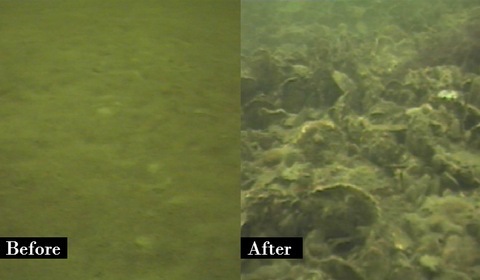 Before and after shot of a restored oyster bed. Photo by the Paynter Lab/University of Maryland. Results have been promising, Goldsborough said. The Harris Creek restoration site has seen 52 million new oysters and 110 acres of oyster bed in 2012. But not everyone welcomes the development. The oystermen, for example, would like to harvest the new oyster beds, but can’t, said Jim Mullin, director of the Maryland Oystermen Association. And what few oyster bars are open to commercial harvesting are overworked, said Tiffany Granberg, an educator with the Chesapeake Bay Foundation. For example, when Granberg and boat captain Foster Nost drop a 40-pound dredge over the commercial oyster bed off the shores of Annapolis and drag it over the shells, they find only 12 live oysters in their haul. A natural, healthy bar averages 200 to 300 oysters per square meter, Granberg said. The recovery projects also face obstacles. The larvae won’t grow on the muddy estuary floor, so restoring the oyster beds requires thousands of shells for larvae to grow on, Goldsborough said. But shells are in short supply. So scientists have placed chunks of concrete from demolished bridges and concrete igloos called “reef balls” as substitute ancient reefs. For Nost, bringing back the oysters is about more than just ecology or business. It’s about restoring the state’s cultural heritage, he said.